Strawberry Swing, a single from Coldplay’s new Viva La Vida album, is being promoted in a music video animated and shot by RSA director Shynola. 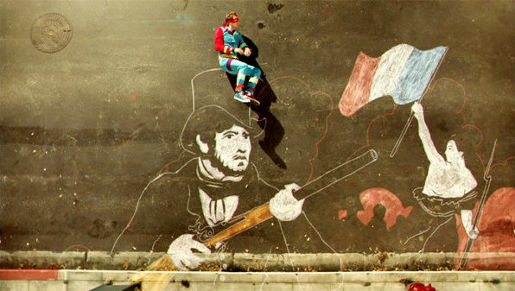 The video shows Chris Martin in a stop motion chalk drawn fantasy world. Chris Martin appears as a superhero battling a giant squirrel to save a damsel trapped in a giant tea cup. Strawberry Swing was filmed by Shynola (Chris Harding, Richard Kenworthy and Jason Groves) via RSA Films, with producer Margo Mars. Post production was done at The Moving Picture Company, London, by producer Chris Allen, VFX supervisor Tom Harding, VFX team Lisa Ryan, Alex Harding, Sterling Archibald, Ashley Tyas, Dave Haupt, and colourist Jean-Clement Soret and George K.
The video was commissioned by Kirstin Cruickshank at EMI Records.